GENERAL APPEARANCE: Balanced, sturdily built, long-haired pointing dog; rectangular in shape, neither too course not to refined in build. Skin without folds nor dewlap. Lips not pendulous. HEAD: Dry, in balance with the body, showing more length than width. Skull and muzzle equally long. SKULL:l should be slightly rounded, not narrow, but without giving the impression of being broad. It merges with a slight rounding into the cheeks. NOSE: Black for dogs with a black ground colour, brown for dogs with a brown or orange ground colour. Nose well developed, not split; nostrils well open. MUZZ;E: Powerful, tapering gradually to the nose, without getting pointed. Bridge of nose straight, wide, viewed from the side neither concave nor convex. LIPS: Tight and not pendulous. EYES: Set horizontally, medium in size, round, with tight lids, without showing haw; neither protruding nor deep set. 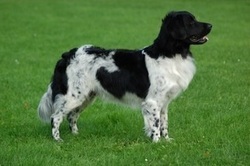 Colour dark brown for dogs with black ground colour, brown for dogs with brown or orange ground colour. Bird-of-prey eyes are objectionable. LEATHERS: Set fairly low. Auricle so little developed that ear flaps hang closely, without fold at the base, along the head. Not admitted are ears with a strongly developed auricle which do not fold directly at the base of the ear, but further down so that they do not hang flat against the head. The ears are moderately long and have the form of a mason's trowel. The feathering of the ear is a typical characteristic of the breed: rather long at the base of the ear, decreasing in length gradually, the lowest 1/3 part of the ear covered with short hair. The coat must be straight; slightly wavy is permitted, but curled is objectionable. TAIL: Long, reaching to the hock, not set high. At ease carried downwards, its last third part may bend upwards in a gentle curve. In action, the tail is lifted, but never so as to curl. The tail is covered with longer hair all around, without curls or waves, not feathered, but bushy. HIND FEET: Round with well developed pads. COAT: Long and smooth all over the body. Only over the croup there may be a slight wave. The coat on the head is short. The coat at the back of forelegs and at the breeches is well developed, more bushy than feathered. A somewhat curly coat indicates crossbreeding; therefore dogs with that sort of coat should not be recognized as Stabyhoun. COLOUR: Black, brown or orange, with white markings. Ticking or roan in the white is permitted.